A tsunami crashed into beach resorts and fishing villages on Java island Monday, killing at least 226 people and leaving scores missing after bulletins failed to reach the region because no warning system was in place. The Java coastal area was spared by the devastating Asian tsunami of 2004, but many residents recognized the danger when they saw the sea recede. At least 23,000 people fled their homes, either because they were destroyed or in fear of another tsunami, Dudi Junaidi, an official at an emergency coordination post in the worst-hit area of Pangandaran on Java's southern coast, said Tuesday. Frantic tourists and villagers shouted "Tsunami! Tsunami!" as the wave more than 6 feet high approached. Some climbed trees or fled to higher ground to escape while others crowded into inland mosques to pray. "We saw a big wall of black water. I ran with my son in my arms when I looked back, the waves were at our house, they destroyed our house," said Ita Anita, who was on the beach with her 11-month-old child and other relatives. "The water knocked me down, my son slipped out of my hands and was taken by the water." Anita, 20, and her husband live 30 feet from the beach in Pangandaran, a resort popular with tourists. Also on the beach were her son, mother, sister, brother, nephews. All except her mother are missing. She said a series of large waves as tall as coconut trees came and then the water began to recede. "When the wave receded, there was total panic. 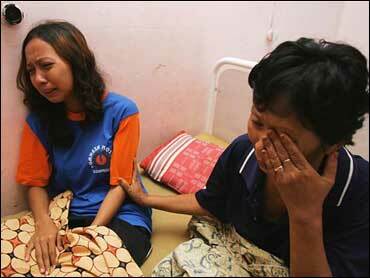 Everybody was looking for everybody," Anita said from her hospital bed at the Pangandaran medical clinic. She said she was swept inland by the wave into a rice paddy, tossed around and dragged across asphalt before she managed to climb to safety on the roof of a house. Early Tuesday, desperate villagers and soldiers dug through destroyed homes and hotels looking for survivors as the death toll rose to at least 174, officials said. Junaidi said at least 172 people were killed in the Panganderan area, while the state news agency Antara said 41 others died in nearby Cilacap district. Thirteen others died elsewhere along the coast, officials and el-Shinta radio station reported. Junaidi also said 86 people were missing in the Panganderan area. He said a Pakistani national, a Swedish national and a Dutch national were among the dead. "I don't mind losing any of my property, but please God return my son," said Basril, as he and wife tearfully searched though mounds of debris pile up on the beach at Pangandaran, a resort area popular with foreign tourists. Nearby, the body of a woman lay on the beach, covered with a mat. At the Pangandaran medical clinic, 46 bodies were laid out in yellow body bags and weeping family members were coming in and identifying the dead. He said a Pakistani national, a Swedish national and a Dutch national were among the dead, but did not give their genders or names. "We are still evacuating areas and cross-checking data," Red Cross official Arifin Muhadi told The Associated Press. Regional agencies had warned that a 7.7-magnitude earthquake that struck 150 miles off Indonesia's southern coast was strong enough to create a tsunami on Java. But there was no warning system for those on the southern coast. Meanwhile, thousands of terrified residents set up camp in the hills overlooking the sea. The waves sent boats, cars and motorbikes crashing into resorts and fishing villages. Houses and restaurants were flattened along a 110-mile stretch of the densely populated island's southern coast. Jan Boeken, from Antwerp, Belgium, said he was sitting at a bar when his waiter started screaming. "I looked back at the beach and saw a big wall of thundering black water coming toward us," said the 53-year-old, who escaped with minor cuts to the head and knees. "I ran, but I got trapped in the kitchen, I couldn't get out. I got hit in the body by debris and my lungs filled with water." Most of the victims were believed to be Indonesians, but at least one Swedish tourist was being treated for injuries at a hospital near Pangandaran and his two sons, 5 and 10, were missing, said Jan Janonius, a Swedish Foreign Ministry spokesman. A witness told el-Shinta he saw the ocean withdraw 1,500 feet from the beach a half-hour before the powerful wave smashed ashore, a typical phenomenon before a tsunami. "I could see fish jumping around on the ocean floor," Miswan said. Witnesses said the wave came several hundred yards inland in some places. Buildings sit close to the beach in Pangandaran. Pedi Mulyadi, a 43-year-old food vendor, said he was waiting on the beach for customers when the wave struck, killing his wife, Ratini, 33. The pair were clinging to one another when they were swallowed by the torrent of water and pulled 300 feet inland, he said. "Then we were hit, I think by a piece of wood," Mulyadi said. "When the water finally pulled away, she was dead. Oh my God, my wife is gone, just like that." Roads were blocked and power cut to much of the area. Damage and casualties were reported at several places along the 110 miles of beach affected, officials and media reports said. "All the houses are destroyed along the beach," one woman, Teti, told el-Shinta radio. "Small hotels are destroyed and at least one restaurant was washed away." Indonesia has installed a warning system across much of Sumatra island but not on Java. The government has been planning to extend the warning system there by 2007. Java was hit seven weeks ago by a 6.3-magnitude earthquake that killed more than 5,800 people, but was spared by the 2004 tsunami that killed 216,000 people, nearly half of them in Indonesia's Aceh province. Chris Goldfinger, an earthquake expert at the College of Oceanic and Atmospheric Sciences at Oregon State University, said Monday's quake was probably not related to the 2004 tsunami though some of the tremors in the region since then were related. The May earthquake did not affect the part of the island hit by Monday's tsunami, which was spawned by a quake that struck deep beneath the Indian Ocean 150 miles southwest of Java's coast. The quake struck at 3:24 p.m., causing tall buildings to sway hundreds of miles away in the capital, Jakarta. The strength of the temblor was revised upward from magnitude 7.1 after a review by a seismologist, the U.S. Geological Survey said. The quake was followed by a series of powerful aftershocks. After the quake, the Pacific Tsunami Warning Center and Japan's Meteorological Agency issued warnings saying there could be a tsunami in the Indian Ocean. The tsunami struck Java about an hour after the quake and its effects could be felt as far as Bali island and near Australia's Coco Islands. Indonesia is on the so-called Pacific "Ring of Fire," an arc of volcanoes and fault lines encircling the Pacific Basin.